While the whole world is focusing on calorie counting and eating healthy, there is still a few places where you get to break all the rules and enjoy the best burgers. It was during the 2018 season that the NFL team announced a brand-new menu available to all the fans attending sports events at the University of Phoenix Stadium. The item on the new menu that attracts the most attention and will continue to do so for quite some time is the Gridiron Burger contains around 805 grams of fat and approximately 8,600 calories. With the new menu unveiled the Arizona Cardinal’s felt it was the perfect time for the Gridiron Burger Challenge. Before jumping into the challenge, you might want to know what exactly you about to eat as the Gridiron Burger is no ordinary burger and is made up of no less than five hot dogs, five 1.3 lb beef patties, 20 slices of cheese, eight chicken tenders, five bratwursts, and 12 oz of fries. The 7 lb burger also includes eight pieces of bacon and is wrapped in tanker sauce, created by chef Sean Kavanaugh, with tomatoes, pickles and lettuce placed with all the other yummy ingredients between a 10in bun. 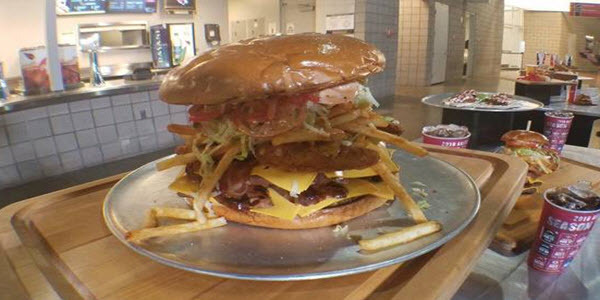 This amazing burger is offered to all Cardinals stadium sports attendants at a price of $75. Chef Kavanaugh is all in on the idea of turning the juicy burger into a challenge and fans wins a free jersey as well as a picture on the Jumbotron if they get to finish the entire Gridiron Burger within an hour. The burger’s calories content is guessed at no less than 8,600, and the 805 grams of fat also includes the tanker sauce. According to Kavanaugh the 20 slices of cheese are the heftiest contributor to the number of calories and adds around 2,080 on their own, while the hamburger meat adds around 1,650 calories. The burger is simply delicious, and for those who are not quite up to the challenge a smaller version is created, it can be called the diet version if you like and it costs $22. The Gridiron Grill Menu, unique to the Arizona Cardinal Stadium also features a whole selection of other notable items of which one is the Cardiac Cards Dog. Again, the Cardiac Cards Dog is no ordinary hot dog and includes a foot-long beef hot dog, which is wrapped in a delicious burger patty, then both of these are re-wrapped in bacon, topped off with queso, pico de gallo and yes lots of cheese. Get to the stadium and make sure you go hungry as other items on the menu include Taco-Dilla and you have to try the Dirty Fry Bird, which consists of six fried chicken legs and a pound of fries. Chef Kavanaugh loves that the new menu gets everyone excited and he says the main focus was to offers everyone attending the games everything they need to enjoy themselves, which is why it was such fun creating a menu that ensures sports fans get to indulge in delightful new items.